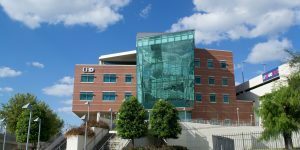 The UHD part-time MBA can be completed in two or three years. Classes are offered in a hybrid form, with some classes taking place on campus and others online. Core classes are offered on Monday and Wednesday nights, which allows students to complete two core courses each eight-week term. Concentration classes are offered Tuesday and Thursday nights. Students may elect to pursue a “soft start” to their MBA, where, in the first year of a two-year path, they pursue their concentration. Accounting and supply chain management concentrations require 19 credit hours. Sales management/business development, finance, human resource management, international business, investment management and leadership concentrations require 16 credit hours. In the second year, soft-start students take 20 credit hours of MBA core classes. Traditional-start MBA students, on the other hand, take core classes the first year, followed by concentration classes in the second year. Students interested in a three-year path to an MBA can also pursue a soft start where they work on their concentration the first year and then take the core classes in the second and third years. Or they can elect to pursue a traditional start by taking core classes in the first two years and concentration courses in their third year. An MBA in general management is only available to students who elect for a traditional start. UHD offers MBAs in the following concentrations: accounting, business development/sales management, finance, human resources, international business, investment management, leadership, supply chain management. Part-time MBA students at UHD are generally fully employed and looking to advance their careers through continuing education. UHD’s student body is extremely diverse, with 47% Hispanic, 25% African American, 17% white, 10% Asian American and 2% foreign nationals attending the university. The overall diversity is reflected in the Part-Time MBA program. At $532 per credit hour for in-state students, tuition for a part-time Davis UHD MBA varies depending on the concentration. Students concentrating on finance, human resource management, leadership management, or business development/sales management will pay $21,840. Concentrations in supply chain management, international business or accounting cost $23,940. An MBA with a general management concentration costs $18,088. Out-of-state students pay about $28,300 and out-of-country students pay around $28,480. Official transcripts from other universities attended, official GMAT scores, two letters of recommendations from professional references, a personal statement about why you are pursuing an MBA and a resume.